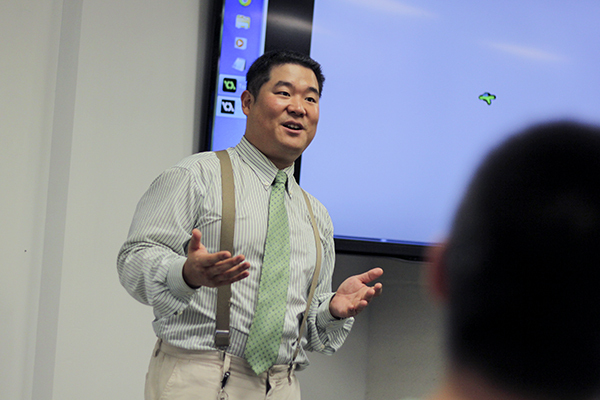 Juman Byun, a professor in the computer science department, teaches a computer game design and programming class in Tompkins Hall. Updated: Oct. 2, 2015 at 5:15 p.m.
More donors are paying to fill the offices of the Science and Engineering Hall. The University installed a new faculty member in the Karlgaard professorship and chair of electrical and computer engineering earlier this month, the second endowed chair in the School of Engineering and Applied Science to be announced by officials in September. Experts say that adding more endowed chairs to a single school is a sign of prestige and could draw more donations and accomplished professors to a school. Ahmed Louri was installed as the first recipient of the Karlgaard professorship and chair of the electrical and computer engineering department in a ceremony last week. And Provost Steven Lerman will return to GW after a year-long sabbatical to be installed as an A. James Clark chair in civil and environmental engineering. David Dolling, the dean of the School of Engineering and Applied Science, said the unveiling of the $275 million Science and Engineering Hall last winter has led to an increase in supporters and donations. Officials have said for years the new building is a key step in increasing research at GW. “Faculty, students and donors can all see clearly the potential that Science and Engineering Hall offers us for education and research,” Dolling said, adding that he hopes to see more donors give to endowed professorships in the coming years. Dolling has said he is focusing his fundraising efforts on smaller donations to name things like classrooms and labs – areas donors generally prefer over donations to the construction of a building. About 13 percent of the University’s entire endowment went toward funding professorships across GW, according to an endowment stewardship report from 2014. And $15 million of the University’s $1 billion campaign will go toward SEAS faculty, including funding endowed faculty. Aristide Collins, the vice president for development and alumni relations, said endowed professorships are key for programs to grow over time. “Endowments play a fundamental role in the continued growth and enhancement of academic programs, creating long-term benefits to students and faculty which ensures the University’s ability to thrive in the years ahead,” Collins said. Experts said an increase in endowed professorships reflects more interest by donors in a school overall. Mikyong Kim, an associate professor of higher education administration in the Graduate School of Education and Human Development, said an increase in the number of endowed professors indicates more interest in specific fields. “Having more endowed professorships is a sign of growth, focus and trust in the field,” Kim said. Lloyd Armstrong, the former provost of the University of Southern California and a professor studying the future of research universities, said an endowed professorship can cost a donor about $1 million to $2 million paid over a period of a few years, and the typical endowment payment rate gives professors between $40,000 and $80,000 in bonuses per year in addition to their normal pay. He added that these professorships are considered more of an honor than a pay increase. “However the money is used, being offered an endowed chair is generally considered by faculty to be a significant public recognition by the University of exceptional quality, and so getting an endowed professorship or chair is a coveted honor,” Armstrong said. These types of honors are attractive to potential faculty members and draw more of them to universities, David Figlio, a professor of higher education at Northwestern University, said. Professors can bring funding for research to another university and extra prestige to their department and school, he said. About $15 million of GW’s $1 billion campaign will go toward SEAS faculty, not faculty for the University as a whole.